A Short Path Thermal Desorption (SPTD) system for the analysis of volatiles and semi-volatiles by GC and GC/MS. The SIS TD-5 is a "short path" thermal desorption system. It provides unattended thermal extraction (thermal desorption) and injection of volatile and semi-volatile organics from solid, liquid and gas samples into a gas chromatograph (GC). The system delivers samples into the GC along an optimal “short path,” thereby eliminating transfer lines and cross-sample contamination issues found in previous systems. A sample for analysis is introduced into a desorption tube, which is then fitted with a needle and attached to the TD-5 Desorption Unit. The Desorption Unit sits over the GC injection port, where, upon signal from the PC software, it automatically injects and desorbs the sample into the GC injection port and column using the temperatures and times prescribed in the desorption method. The TD-5 System consists of the Desorption Unit (which contains the sample analysis hardware), an Electronics Console (which contains a microprocessor and power supply), and a Windows- based Thermal Desorption software (which provides control and monitoring of the system). This software can be fully integrated with selected GC data systems (e.g. 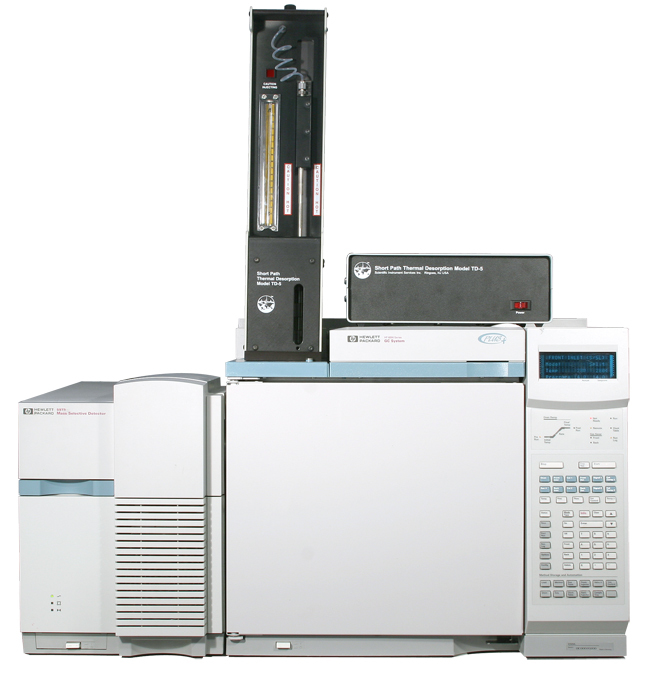 Agilent ChemStation), or it can operate fully independently from the GC data system. Various accessories are available such as the Cryo-Trap, which cryogenically cools and rapidly heats the GC column head for improved chromatographic resolution. TD-5 system on an Agilent 6890 GC. It enables the sample, which is trapped on an adsorbent media contained in a Silco Coated SS (desorption tube), to be subjected to rapid heating. The desorbed component can be easily and efficiently transferred into the injection port of the gas chromatograph from a glass lined stainless steel sample tube and its associated injection needle. This provides for a short transfer path for the sample in an inert environment to minimize the degradation of labile sample components which often decompose upon contact with the hot catalytic metal wall surfaces of the transfer path of other systems. Third, each sample has its own individual adsorbent trap tube and needle to eliminate the possibility of cross-contamination from sample to sample, thus preventing any "memory effect" due to overloading of the sample in the Silco Coated desorption tube or due to residues from previous samples. Stainless steel sample tubes (or silco treated) are inert to samples and strong for sample handling and transporting. Rapid cryogenic (CO2 or LN2) cooling and heating of the GC column head for improved chromatographic resolution (optional Cryo-Trap™ accessory). Mounts overtop most GC injection ports—easily removable and transferable. Automatic injection and desorption of sample into GC (pneumatic driven injector). Windows-based software for control and monitoring of the system. Desorption: temp range: 20 ° to 400 °C, either isothermal or temperature programmed. Max heat rate: 100 °C/min. Cryo-trap: min temp: -70 °C (CO2) or -180 °C (LN2). Max temp: 400 °C. Max heat rate: 10 °C/sec. 115 +/- 10%, 10 amp max. see also the Complete List of Application Notes. What do you want to analyze? View application notes on Arson, Air (Pollution, Airplane, Automobile, Vacuum Pumps), Beverages (Carbonated, Milk, Wine, Coffee), Carpet, Chewing Gum, Clothing, Cologne/Perfume, Cooking Oils, Explosives, Flowers, Food Packaging, Plastic Wraps, Fruit (Blueberry, Peaches, Cranberries), Electronic Components, Paint (Latex, Oil-base), Soil, PCB, PNA, Food (Spices, Pepper, Tea, Honey, Mushrooms, Rice, Truffle Oil), Plants, Pharmaceuticals, Printer Toner, Tires, Full List (60+). The Thermal Desorption Unit sits directly on top of the injection port of most GC's, where it provides direct desorption of both volatile and semi-volatile samples into the GC injection port and column. The system delivers samples into the GC along an optimal “short path,” thereby eliminating transfer lines and cross-sample contamination issues found in previous systems.Samples to be analyzed are collected into stainless steel desorption tubes (or silco-treated)(Fig.1A). A solid sample of inter-est may be packed directly into the tube and subjected to direct thermal desorption. Alternately, the tube may be packed with adsorbent resin such as Tenax™ TA or activated carbon for indirectly trapping analytes from liquid or air samples. Fig. 1A Desorption Tubes can be packed with an adsorbent resin or with solid matrix samples. To analyze a prepared desorption tube (Fig.2), a syringe needle is first attached to the desorption tube, which is then attached to the connector tube on the Desorption Unit (#1). The desorption blocks heat to initial temperature (#2). Carrier gas is sent through the desorption tube for an initial purge time (#3). The system then injects the desorption tube into the GC injection port (#4) where flows are readjusted as required by the method of analysis, i.e. split/splitless,etc. The hinged heating blocks close around the desorption tube (#5) to ballistically heat the sample tube, optionally with a temperature ramp. The combination of the heat applied and the carrier gas flow through the desorption tube will purge the desired components into the GC injection port and onto the front of the GC column. To obtain sharp chromatographic peaks when desorption typically lasts 5 to 15minutes, it can be desirable to focus desorbed components at the head of the GC column. This focusing can be improved by installing a Cryo-Trap, which cryogenically cools the head of the GC column(with liquid CO2 or LN2) during desorption to trap desorbed analytes.After desorption, the Cryo-Trap rapidly heats to volatilize the trapped analytes and quickly release them through the GC column for separation (#6). Figure: Diagram of TD-5 components and how they connect to the GC. 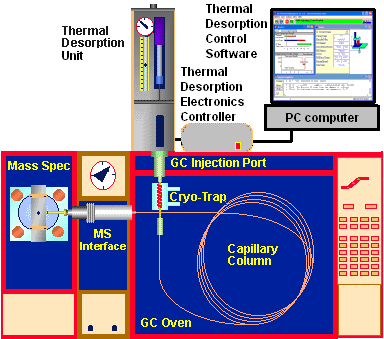 The Thermal Desorption Unit sits on top of the GC injection port and is powered by the Electronics Controller, which communicates with Control Software on the PC computer. An optional Cryo-Trap device cryo-focuses analytes at the top of the GC column. A Complete Description of the Theory of Operation is presented in Technical Bulletin No. 1. When ready to be analyzed, a syringe needle is attached to the desorption tube which is then attached to the connector tube on the Auto injector Assembly of the Desorption Unit. Purging: The carrier gas through the Desorption Unit is turned on via the electronics console microprocessor and the flow through the desorption tube is adjusted via the flow controller, rotameter and/or the pressure transducer between 1.0 mL/min and 120 mL/min. Injecting: The desorption tube is injected with the needle attached. The desorption tube will pass through the opening in the middle plate of the Desorption Unit base to position the desorption tube in proper alignment with the GC injection port and the normally open desorption block assembly. When injection is complete, the flows are readjusted as required by the method of analysis, i.e. split/splitless, etc. In this position the sample is not being desorbed into the GC since the heating blocks have not yet closed around the desorption tube. The temperature of the tube remains close to room temperature due to the action of the cooling fan, which pulls in room air from the front of the Desorption Unit, thru the view port and across the desorption tube. Carrier gas flows, desorption temperatures, and GC parameters can be adjusted as required. Blocks close and desorption: The Microprocessor Control actuates an air valve which delivers air to the air powered solenoid and moves the hinged heating blocks from the open to the closed position around the desorption tube. The desorption tube will ballistically heat up to the set temperature or the temperature program program ramp for the heater blocked will begin. The combination of the heat applied and the carrier gas flow through the Desorption Tube will purge the desired components into the GC injection port and onto the front of the GC column. The various parameters are set and utilized according to the application requirements. Normally desorption temperatures between 70 degrees C and 250 degrees C are suitable for most applications. The maximum desorption temperature permissible with the system is 400 degrees C.
The heater blocks can be temperature programmed at ramp rates up to 100 degrees/min. Normal desorption times vary from 3 minutes to 15 minutes, however longer desorption times up to 100 minutes are permitted. Since the column is normally maintained at sub ambient temperatures, the desorbed compounds of interest are trapped on the front of the GC column in a narrow band utilizing GC oven cooling or the GC Cryo-Trap Accessory. Despite the long desorption times, the peaks eluted from the column are extremely sharp and well resolved. Desorption complete, cryo-heat, GC start: After the desorption is complete, the desorption heater blocks are opened, the normal carrier gas flow to the GC injection port is turned on, and the GC, Mass Spec, GC Cryo-Trap Accessory is switched to the heating mode and recorders are started via accessory ports on the back of the Electronics Console cabinet which act as remote out switches. The temperature and time parameters are configured in the software. The SIS Thermal Desorption Software included provides visualization and control of all thermal desorption operations through a user-friendly graphical user interface. The user may configure system and thermal desorption methods settings (e.g. times and temperatures) as well as monitor the system status (e.g. temperatures and pressures) during a run. The Thermal Desorption Software can be used fully independent of the GC data system, or it can be fully integrated with certain GC data systems (e.g. Agilent ChemStation™ or ThermoXcalibur™ ). When the software is integrated with ChemStation, MassHunter, and Xcalibur™ thermal desorption parameters get stored directly into the current ChemStation method so that GC and thermal desorption method settings are linked. The run is initiated from ChemStation, and methods may be changed between samples to provide different desorption parameters for different samples. For example, a separate high temperature bake out or blank method can be setup and run between samples to assure the system is clean for the next sample. The software operates Microsoft Windows operating systems. Configure thermal desorption methods including desorption and cryo-trap times and temperatures. Monitor system status including actual times, temperatures, pressures and status during a run. Log sample status and errors. RS-232 (optional USB bridge) communication with TD-5 instrument. Optional Agilent ChemStation, MassHunter or Thermo Xcalibur integration for method load/save and sample run. 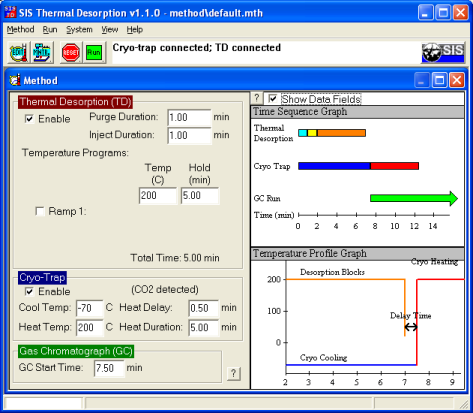 Figure: Thermal desorption control software showing the configuration of parameters for a thermal desorption method. Here, times and temperature set-points are specified. These are displayed graphically on the right side. 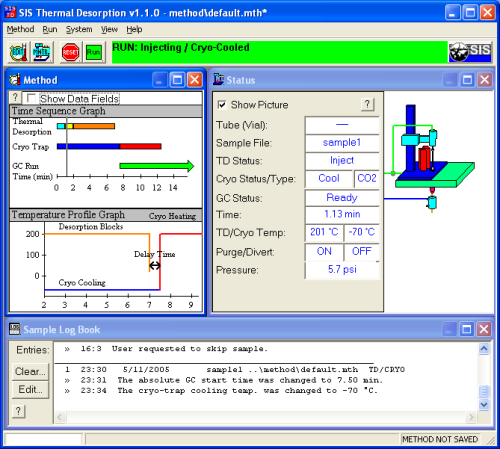 Figure: Thermal desorption control software showing a run in progress. Shown are the time sequence of the desorption process and the temperature program (Method parameters), the history of previous samples run (Sample Log Book), and the status of the current run (times, temperatures, pressures, and animated graphic of the desorption system). The Electronics Console consists of a user adjustable microprocessor electronics control which is interfaced via a 20 pushbutton keypad with a yellow fluorescent display to control the operation of the desorption system. The Main Power Switch controls the power to the entire Desorption System. The Heater Switch turns on the power to the heater cartridges in the desorption tube heater blocks and begins their heating cycle. The Cryo-Trap heater switch controls the power to the circuit for the GC Cryo-Trap Accessory Unit. A Platinum Resistance Thermometer (PRT) in the heater blocks provides for the accurate (+/- 0.1%) temperature readout and also provides for feedback to the temperature controller to maintain the heater block temperatures. A single cable assembly provides the connection between the Electronics Console and the Desorption Unit. The cable has connectors on each end which screw into the electrical feedthru fittings located on each of the two assemblies. The cable can be used reversibly since the connectors on both ends are identical. The TD-5 Controller automatically controls both the cooling and heating of the GC Cryo-Trap accessoty. When ordering the Short Path Thermal Desorption System, a wide range of systems and accessories are available depending on the application requirements of the user. A minimum system should include the Thermal Desorption System (Part #785000) and an installation kit for your make and model of gas chromatograph. Installation and training is recommended at the prices listed below. Alternatively, training is available at S.I.S. at no charge. The items marked “recommended” will make operation and use of the Short Path Thermal Desorption System easier and more convenient. The items marked “optional” should be purchased only if an application which requires it is contemplated. Additional Installation Kits for other makes and models of GC's will also be made available. Call for pricing and availability.